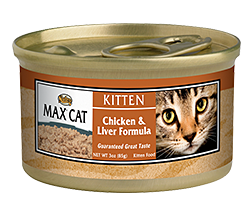 MAX CAT products never use chicken heads, feet or intestines, which may be found in products containing chicken by-products. NUTRO MAX CAT Canned Cat Food comes in several varieties of proteins, such as real chicken, lamb and turkey slow-cooked in broth that your cat will adore. We use natural ingredients in our wet cat food that are fortified with vitamins, minerals & other nutrients for a complete and balanced nutrition, at a price that’s easy on the wallet. Essential vitamins and nutrients, guaranteed great taste and an affordable price make NUTRO MAX CAT Wet Cat Food a smart choice for pet parents looking to feed their cats the best. NUTRO MAX CAT Canned Cat Food is a smart choice for pet parents looking to feed their pets the best. In addition to providing a complete and balanced diet, NUTRO MAX CAT Canned Cat Food provides a range of benefits to promote a healthy immune system. • Nutrition: Natural ingredients fortified with vitamins, minerals and other nutrients for 100% complete and balanced nutrition. • Builds Strong Muscles and Bones: Helps support proper muscle growth and bone and teeth development. 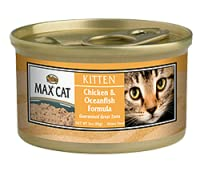 • Great Taste: Slow-cooked in broth for a guaranteed great taste cats love. 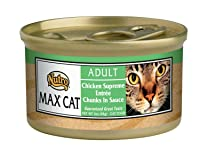 NUTRO MAX CAT Chicken Supreme Entrée Chunks in Sauce is a wet cat food made from natural ingredients fortified with vitamins, minerals & other nutrients like real chicken slow-cooked in a savory broth. NUTRO MAX CAT Kitten Chicken & Oceanfish Formula has an irresistible taste and is made with ingredients that support proper growth and bone and teeth development. 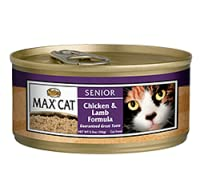 Formulated specifically to meet the needs of senior cats, NUTRO MAX CAT Senior Cat Food contains nourishing natural ingredients made with real chicken and lamb and fortified with vitamins, minerals and other nutrients. NUTRO MAX CAT Roasted Chicken Flavor Natural Dry Cat Food is made with select ingredients to support health and wellness with a guaranteed great taste cats will love.